Grasshoppers undergo incomplete metamorphosis, which means that their immature forms, called nymphs, look somewhat similar to the adults. The most obvious difference between adult grasshoppers and the nymphs is that the nymphs lack mature wings and thus cannot fly (and so are easier to photograph). Grasshopper nymphs look similar to katydid nymphs, but grasshopper nymphs can be distinguished by their much shorter antennae. 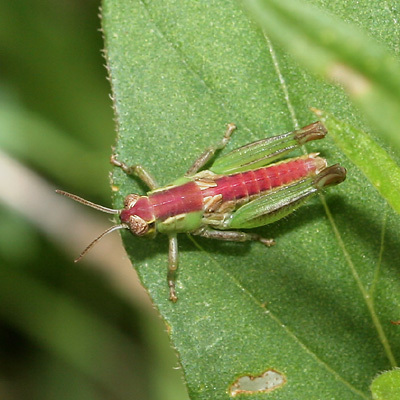 A few grasshopper nymphs like this one are brightly colored. If such brightly colored grasshopper nymphs feed on similarly colored flowers, then their coloration helps camouflage them, but when they are resting on a leaf like this one, they are easily spotted by sharp-eyed birds (and photographers). 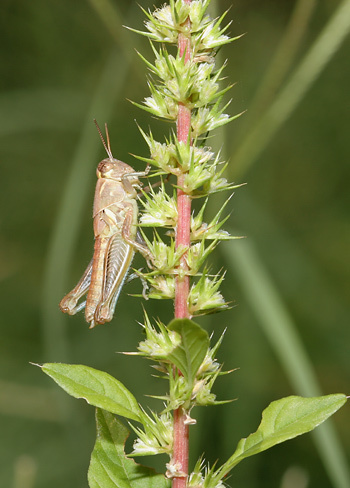 Grasshoppers are in Order: Orthoptera along with crickets and katydids, but they are in their own Suborder, Caelifera, which contains several grasshopper families. Many grasshopper species are in the Shorthorned Grasshopper and Locust Family (Acrididae). 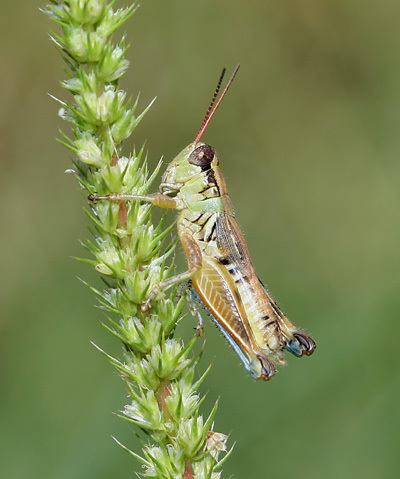 If you are interested in grasshoppers, check out the excellent and informative website: Grasshoppers: Their Biology, Identification and Management.